While the weather outside has been rather warm these last few days, winter is still here and I am looking forward to hot chocolates, building snowmen and bundling up in warm knits. 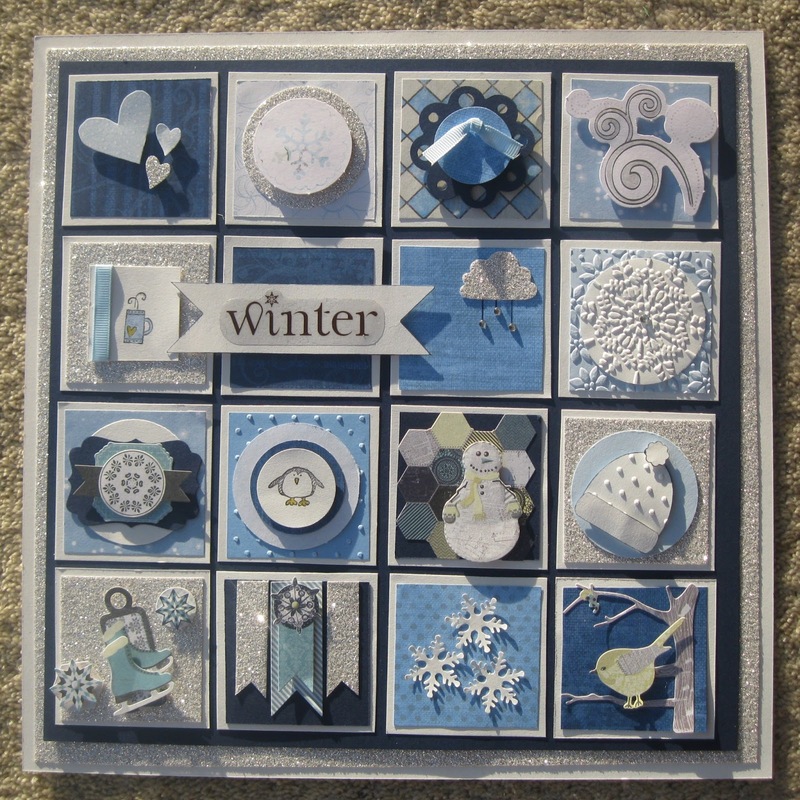 I am trying to start inexpensively decorating my house each season, and so I did this papercraft sampler to hang in a frame in my entranceway. 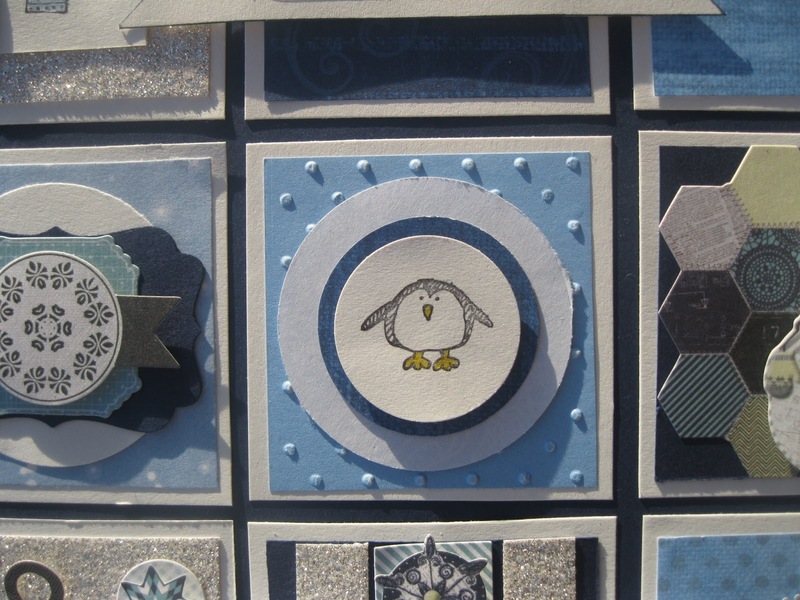 The squares are mounted on white cardstock at 12"x12", then the silver is 11"x11"and the navy cardstock is 10.5"x10.5". Each square is 2.5x2.5", with the inner squares at 2.25" x 2.25". I had a lot of fun coming up with different designs and items for each square. 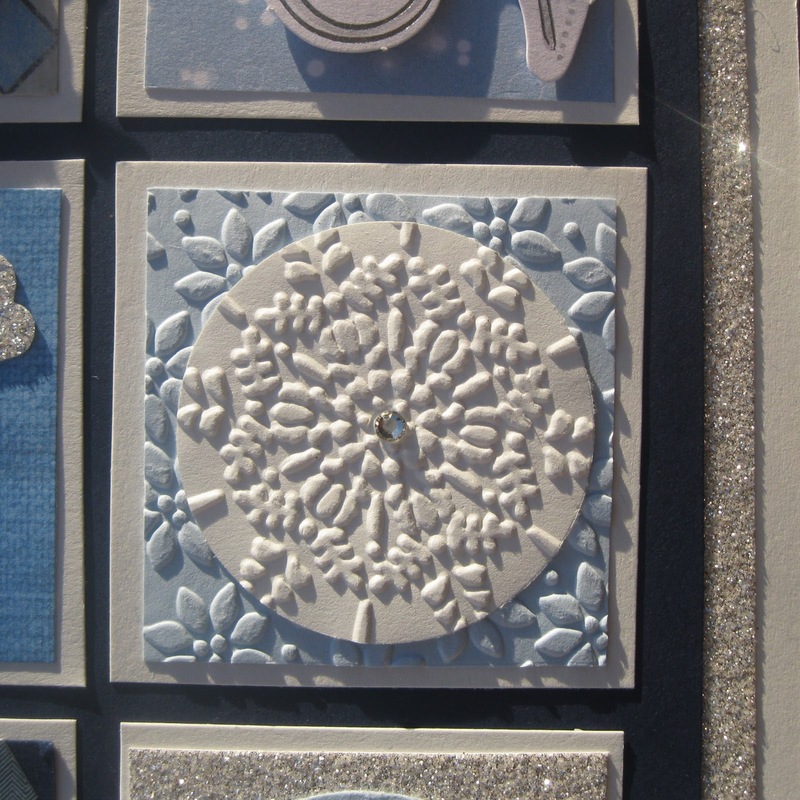 Some of them are very traditional, such as the snowman, snowflakes and winter hat. Other squares such as the hearts were tied into the winter theme by keeping the same colour scheme throughout the sampler. I especially love my little penguin square! 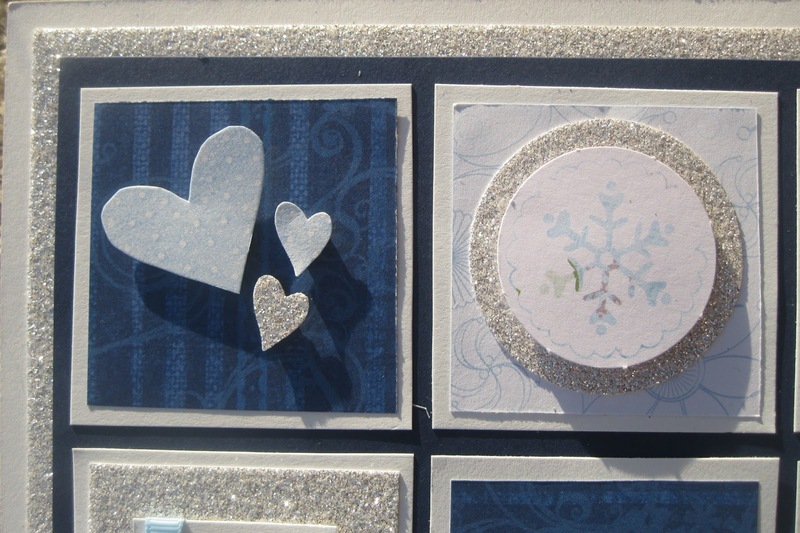 I also wanted a few snowflake and glitter elements, as well as dimension with layered stickers and foam squares. The squares are a mixture of stickers, punches and stamps that I had in my supplies. If you would like instructions on any particular square, please feel free to ask! What is your favourite square? Stampin' Up: Silver glitter paper, Night of Navy Cardstock, Night of Navy Stampin' Write marker, Bashful Blue cardstock, Bashful Blue Ink, Bashful Blue ribbon, Classic Black ink, Summer Starfruit Stampin' Write Marker, I Heart hearts stamp set, Mini Glue Dots, Every little Bit stamp set, Cupcake Punch, Basic Rhinestones Jewels, petals plenty Embossing Folder, Polka Dots Embossing Folder, Northern Flurry Embossing Folder, Decorative Label punch, Itty Bitty punch set. 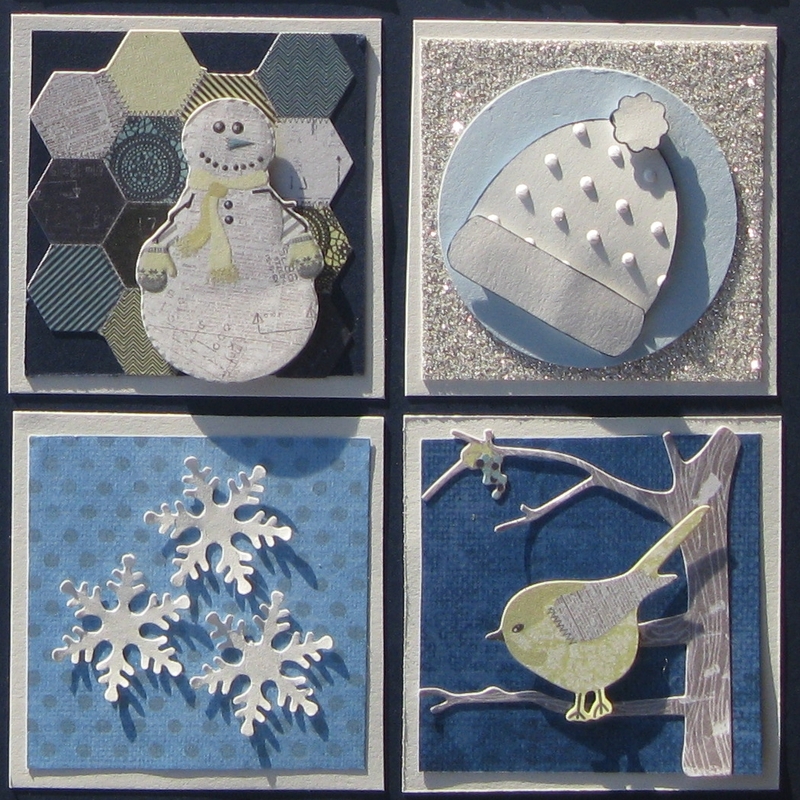 Creative Memories: White cardstock, Shape maker System, Circle Punch, 12" Rotary trimmer, Cheerful Power Palette, Cheerful Winter Additions, Memoranza 2008 paper, Quick Album Kit Winter Wonderland, Scallop Circle Punch, Foam Squares, Precision Point Adhesive, Jewel Winter Additions, Days Of Winter Layered Stickers, Circle Maker, Square Maker, Corner Rounder, Snowflake punch. Linking up with Matariki Crafting, Show and Tell, An Inky Situation and Real Family Fun. That looks really pretty! Great job! how gorgeous! As a Creative memories fan with over 30 albums I am gutted that they have stopped in New Zealand and Australia! gorgeous! As a Creative memories fan with over 30 albums, I am gutted that they have stopped in New Zealand and Australia! Hi Kimberley, CM is being redeveloped as Close To My Heart- you can find out more details online. love the colour ways and I agree the penguin is adorable! Love it! Great idea :) my fav is prolly the little bird :). And thanks for linking up - yay! I love the idea of reflecting the seasons in your home decor, I'm kind of working with that idea in my own way. I love the cloud on your sampler - its simple and elegant! Your sampler looks great! My 4 year old is peering over my shoulder telling me how beautiful the snowman is!- Great praise!